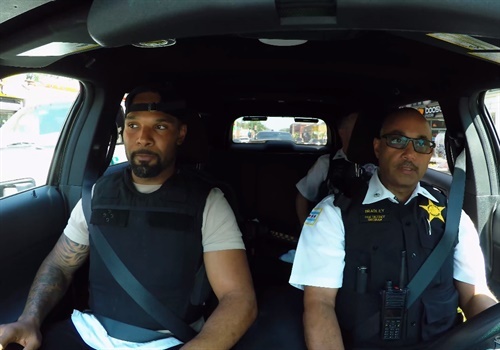 VIDEO: Retired NFL Player Does Ridealong on Chicago's South Side"
Former Chicago Bears star running back Matt Forte recently did a ridealong with Chicago police on the streets of South Side Chicago's Auburn Gresham neighborhood. The department posted a seven minute video to Facebook, chronicling Forte's experience during the day-shift ridealong. "Being in the car, and being in pursuit, my heart was beating a little bit," Forte said in the Facebook video. "It shows you how seriously they take their job." Forte—who played ten seasons in the NFL, most of them with the Chicago Bears—said that he now has a deeper appreciation for law enforcement officers and the job they do. "The narrative, even to the young kids is that, all police officers are bad, and that's not the case, so we gotta find some common ground," Forte said.